Bubbly with a view at the Wine & Spirits Top 100 Tasting in 2012. Photo from Wine & Spirits’ website. Coming up on Tuesday October 21st is one of the most fun wine events of the year, the 11th annual Wine & Spirits Magazine’s Top 100 Tasting Event. You will be able to taste wines from the Top 100 wineries of 2014, with many of the winemakers present. There will also be great food, from oysters to cheeses, and bites from new and notable restaurants like 1760, Dirty Habit, Stones Throw, Shed, Lolo, and the Barrel Room. 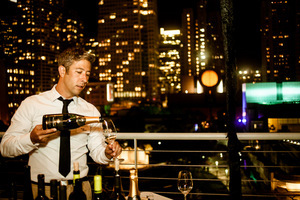 The event is at City View at Metreon, and fingers crossed for some gorgeous fall weather so we can enjoy our Louis Roederer and Dom Ruinart on the outdoor terrace, am I right? Get your tickets here, which range from early VIP entrance ($150 at 5:30pm) to general admission ($110 at 6:30pm). The event is a benefit for San Francisco Baykeeper, supporting their initiatives that fight water pollution. See you there! City View at Metreon, 135 4th St., 4th Floor.